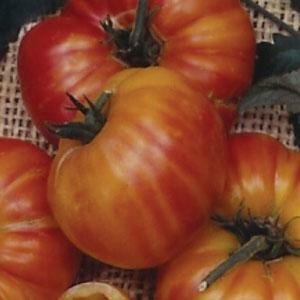 This late-season tomato is another bi-color that originates in the Mennonite area of the Shenandoah Valley in Virginia. Old German tomatoes grow to 1 to 2 pounds in size and are yellow with red mottling and striping on the skin and throughout the meat. The indeterminate vines don’t produce very abundantly but the fruit that is harvested is sweet and great looking. Outstanding Features: Unique orange-red coloring. Click here to buy Old German Tomatoes direct from www.buygardenvegetables.com.